Sakai Guides and DocumentationSakai Basics HomeHow do I assign grader permissions to teaching assistants? Important: By default, Sakai only assigns grader permissions to Instructors. Instructors must set grader permissions for Teaching Assistants before they can grade students. There are two methods to assign grading permissions for Teaching Assistants: using the Section Info tool for courses with multiple sections and TAs, or using Grader Permissions within the Gradebook tool. Before proceeding, make sure that your TA is added to your Sakai course site and assigned TA permissions using Add Participants. 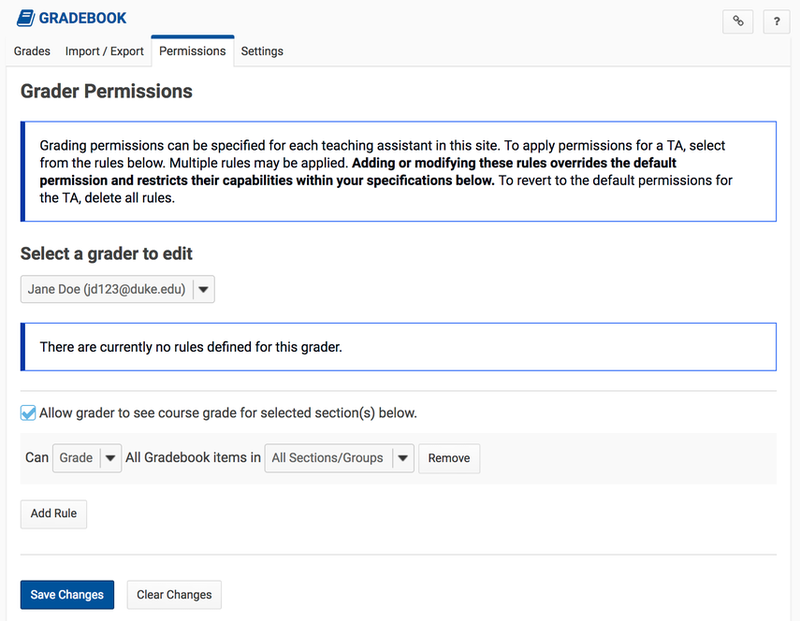 If a course does not have multiple sections, an Instructor can assign grading permissions in Gradebook. This is the easiest way to grant permission for a TA to grade the entire course. Navigate to Gradebook, and select Permissions. Use the drop-down menus to define the teaching assistant's grading rights. If a course contains multiple sections and Teaching Assistants, the Section Info tool provides a way to assign multiple TAs to multiple lab or discussion sections and limit TA access to grade students. You can set these permissions when adding a teaching assistant to a section in Section Info.